Welcome to the country of Gwyndlegard! Or, well, it's not much of a country nowadays; all traces of civilization were destroyed recently in a mysterious accident (someone meddling with the Relic of the Rock perhaps?) and now the land is up for grabs. Perhaps YOU will be the new ruler of this once, and to-be, great nation? This is a classic B&D scenario, a random map with a better looking map and some lil' surprises. And yes, that's about it. As this was mainly made for local amusement (i.e. LAN games) don't expect the greatest, most advanced multiplayer scenario of all time. However, if you enjoy an occassional random map and perhaps even enjoyed playing "Gwyndlegard", you might find some joy in this as well. This map contains the outlay of the land, the terrain, the mountains and most of the roads and paths. All cities and villages are gone and it's up to you rebuild them or build new ones wherever you see fit. And, most importantly, give whoever you're playing with a run for their money and beat the crap out of their inferior militias! Each player will control a main hero, all taken from the story in Gwyndlegard. If you have played Gwyndlegard (the single player version) you will recognize them all. If not, you might want to consider playing Gwyndlegard! In other words, you don't need to have played the single player version to play this, but it might help in understanding who the heroes all are and what the locations looked like before civilization ended. Want to play the single player version? Download it here. Gwyndlegard- Multiplayer Edition is a tie in to the recent and hugely popular Gwyndlegard, by the same author. It involves a simple RM game with heroes given, placed on a custom map. On its own merit, it is no better or worse than a randomly generated map. I feel unable to award a high score here since my experience of it was basically a comparison of the original to our own playing. I did not enjoy this any more than I would any other random map. All players start with equal units, and a well balanced hero. The map has been modified so it is relatively even, with each player getting a fair number of chokepoints and resources. The map was creatively poor, as all that has been done is the addition of a hero. I was left feeling "is that it?" A blood-style system where players get resources or units in exchange for kills and razings would have been most welcome. The map is a straight port from the single player game, but with slight modifications to the resource locations. This makes it fairer, but the rivers are not connected and so end up simply as a wall of galleons to harrass soldiers crossing the bridges. Some players don't get natural chokepoints to defend, while others do, which is a minor niggle. Unfortunately, the map just doesn't seem suited to RM. The resources present expire very quickly, and the map is difficult with anything other than 4v4. The instructions provided are adequate for the game to be successfully played. It is really quite self explanatory. Minimalist at best, Gwyndlegard - Multiplayer edition is very much like the bonus features on a DVD. If bundled with the Game itself, this would provide a welcome addition to the family. It does not have enough variety to stand alone. Regrettably, I recommend you play the original, or play a random map instead. The two have sadly not combined very well. It plays just like an original random map game, beside the fact that you can obtain extra heroes, I tried it one single player, against the Standard AI's and it all worked pretty well, although only I could obtain the heroes. (I am aware it should be played on Multiplayer). Each player starts off with a hero to even the odds a little, and there are heroes scattered round the map, this gives an exciting feel trying to find them. Each player has their own unique advantage on the map, whether it be the amount of resources they start off with, the amount of resources local, or the availability of good building land, it really balances out the overall game play. I personally could not think of anything more to add to increase the balance. So a 5. I would have not hesitated to give this map a 5, however it was a random map, and they're not very original, the original thing is that you've turned one of the most epic single player scenarios out into a multi player scenario. Without taking away it's incredibility. Instant 5, without a shadow of a doubt, easily one of the most incredible map designs released to AOK heaven games, the terrain is not random, it's all harmonious to the next piece of terrain next to it, the correct proportions of elevation have been used, without leaving random hills and/or cliffs in the map,forests or isolated trees look beautiful with the surroundings, and it all looks rather magnificent. Obviously there would be little to say here, it's a random map, enough said, instructions are self explanatory, giving it a very, very average mark. However this multiplayer scenario still intertwines with the single player scenario, with all of the heroes, with is rather cool, it also gives you added information, which is unnecessary, but extremely clear, giving this a 5. A rather nice map overall, I would suggest any who have pondered to download it, whether they wish to use it for their own scenarios if they lack Lord Basse's map designing (such as myself :P) or just to play against some friends, which would be just as exciting, keep up the good work. Gwyndlegard – Multiplayer Edition is a highly enjoyable map which has a similar gameplay to a Random Map. Each Player is set in a different location in the country of Gwyndlegard, the range is vast. From Gwynhill to Sarachrion or Whale Island to The Capital. This Multiplayer Map has a highly enjoyable gameplay, battling against your friends to rule Gwyndlegard. What makes this scenario much more enjoyable is the fact that there are Heroes from the single player scenario scattered all around the map. It is very fun racing to see who can find the most. I found no bugs in this scenario nor did I find anything unbalanced. Gwyndlegard – Multiplayer Edition is one of the most highly enjoyable Multiplayer Scenarios I have ever played. Gwyndlegard – Multiplayer Edition is perfectly balanced. Each Player starts off in a unique place. Each place has there own unique hero as well as many others hidden nearby. Also each place is unique because whereas one place may have more resources another might have more building area and another may have more defences like a river. Each Player starts off with an equal amount of starting resources and an equal amount of units and buildings. It is a very ingenious idea to turn your single player scenario into a multiplayer version. The multiplayer version is quite creative because it has a good map design and it is a very good idea placing the GAIA heroes around the map for the players to race and see how many they can find. However this map is not as creative as it can be because it feels too much like a regular Random map. The gameplay is too similar. 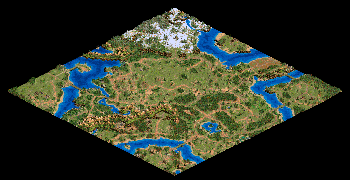 The map design for this scenario is a direct copy of the map from the single player version but with the cities taken out and the resources and GAIA heroes added. Because everything else is virtually the same I will just quote what I wrote for Map Design in my review for the single player version. There is little to say in terms of story because this scenario is like a random map however this scenario sort of collides with single player edition because it has the same map design and uses the original heroes from the single player version. The Instructions are very clear; tell exactly what to do and how to setup the game. Overall Gwyndlegard – Multiplayer Edition is a highly enjoyable scenario which I highly recommend to anyone. It is one of the most enjoyable Multiplayer Scenarios I have ever played. Overall I grant this scenario with a 4.8! Well Done Lord Basse. And Thanks For Making It.